"Whether you live in the tiniest village or the largest metropolis, you live in a watershed, an area whose run-off flows via a network of streams through one outlet into a larger body of water such as a river, bay, or ocean. If that watershed drains more than a couple of garden hoses' worth into the North Pacific, at least one of the six species of Pacific salmon is probably native to it." All along the West Coast, the salmon controversy fills the airwaves and newspapers. Salmon runs on the Columbia River, estimated to have numbered fourteen million fish, now total less than a million. Salmon Nation steps back a few paces to put the situation in context. the story begins with the way life with salmon used to be in aboriginal times, explores the sources of the salmon's present straits, and concludes by surveying the prospects for creating a fresh connection between people and fish, tailored to our times. You'll meet the people at the frontiers of a new salmon economy, who are devising a livelihood that benefits the fish and themselves. Ever Wonder What's Behind That Farmed Salmon Steak? 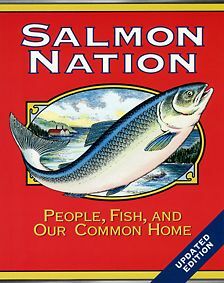 There was a time when salmon were central to everyone who lived in salmon territory. For a few recent decades, however, the business of salmon became the concern of just a narrow slice of the population — only those who caught or hatched or processed them — and was taken for granted by those of us who simply ate them. Now, with the listing of salmon as threatened or endangered species in much of the Northwest including metropolitan Seattle and Portland, salmon are playing a larger role in our lives. Booksellers please call 503.227.6225 for terms and invoice information.